Andalucia, until the arrival of mass tourism in the 1970s, was said to be the most economically deprived region of Europe. But when the writer Somerset Maugham travelled there in the early twenties he described great cultural richness amidst the whitewashed villages- rough-edged guitar and flamenco, colourful parades, and food market after food market that shamed the Harrods food halls. Much of this great richness has been lost to modernity, but the food remains. Still Andalucia is a place of little bars and restaurants on dusty streets serving up impeccably delicious small dishes of salt cod, Serrano ham and manchego cheese, spicy garlicy prawns, thin cut steaks cooked rare and doused in chili oil. And croquettas – our favourite. Croquettes, like so many delicious hot crispy bites (gyozas, samosas, falafals, spring rolls) always seem like something difficult to make and something you leave to eating out, naughty indulgent moments- something we love doing. But this really shouldn’t always be the case, they couldn’t be easier- also much nicer to make treats like this that are on the unhealthy side at home; as you can make sure they are made to your liking using- free range eggs, sweet potato versus a heavy béchamel sauce or normal white potatoes, little or no flour, baked rather then fried. These little delights are not only easy to make (make sure they are piping hot to serve! ), but a very nice change to your typical, sometimes bland, croquettes- they are made with sweet potato, packed with a tasty combination of spices and coated in panko crumbs, instead of bread crumps, for a lighter and crispier bite. Sweet potatoes are an excellent source of fiber and vitamin A and C, so feels like a healthier option- but for us we find them the perfect base for taking on spices and flavors. These are the perfect snack to eat when hosting friends this weekend, keeping the Andalucía dream alive, dipped into a spiced yoghurt and washed down with cold white wine. preheat your oven to 200c boil the cut up sweet potato in a pot for around 15-20 minutes, make sure they are cooked through, then mashed, then set aside to cool In a large bowl add the sweet potato, feta, chorizo, spring onion, pressed garlic, 1 beaten egg and 2 tbs of panko crumps and spices. Place in the refrigerator until cold and stiff. 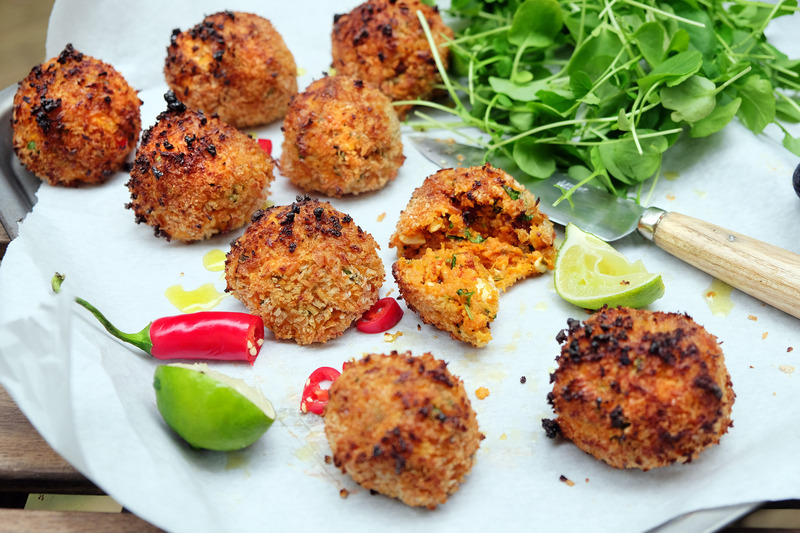 Make into ovals or rounds, place onto greaseproof paper trays and Dip croquettes into the beaten egg and then roll in the panko crumbs with added sea salt and pepper. You can either shallow fry in olive oil, or bake them in the oven sprinkled in olive oil and seasoned, for around 5-10 mins. For extra crisp turn the grill on for a few minutes- take out when golden brown. Serve with a spcied lemony yoghurt dip.